Atmospheric pressure discharges typically form thin filamentary plasma channel. For this reason they are frequently called microdischarges. The microdischarges produce a high density of energetic electrons and free radicals at relatively low energy consumption and so they represent a potential method for flue gas treatment. 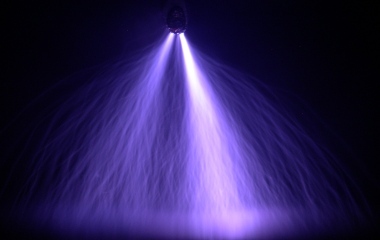 The efficiency of the treatment effect can be enhanced when the discharge plasma is combined with a catalyst. Because of the typical structure of catalysts (pellets, honeycomb monoliths or porous ceramics), it is necessary to study the generation and propagation of microdischarges inside narrow cavities, capillaries, and porous dielectric materials. 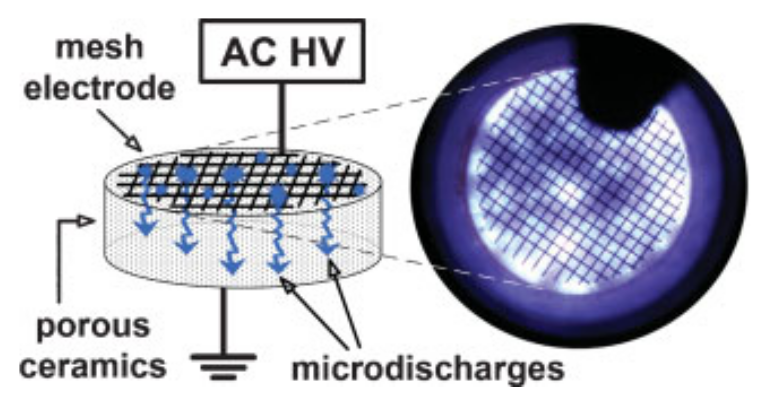 We investigated the generation of microdischarges inside porous ceramics by AC high voltage (Fig. 1). 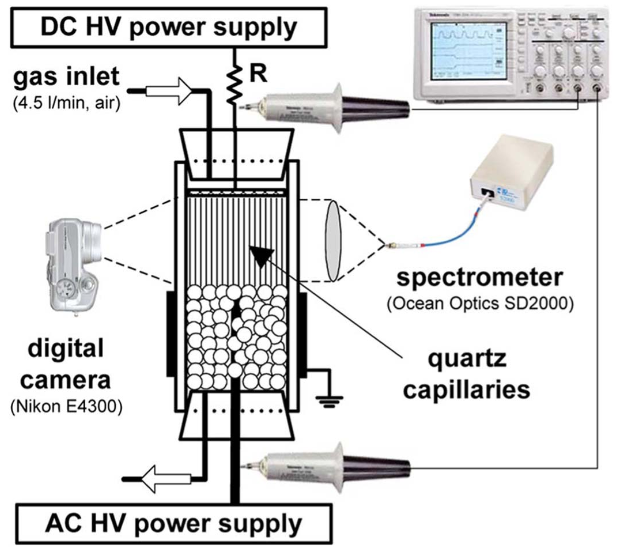 The physical properties of the microdischarges were diagnosed by electrical measurements, photographic visualization, and optical emission spectroscopy. The effects of pore size, discharge power, gas mixture composition, humidity and temperature on the discharge properties and its development were studied. The optimum generation and distribution of the microdischarges was observed with pore sizes of 50 μm and 80 μm. The emission spectra of the microdischarges indicated their strongly non-equilibrium character. A theoretical analysis of the microdischarge mechanism was elaborated, accounting for the pore size and the elementary processes such as ionization, recombination, and ambipolar diffusion. Fig. 1. Illustrative image showing generation of microdischarges inside porous ceramics. Selectivity and energy efficiency of plasma-induced chemical processes can be significantly improved when plasma is combined with a catalyst. The generation of stable discharge plasma inside the narrow capillaries of an automobile catalytic honeycomb is, however, quite difficult. We developed a novel method which uses the combination of packed-bed or barrier discharge connected in series with the honeycomb capillaries (Fig. 2). By the application of DC voltage across the capillaries, streamers are extended from the packed-bed discharge into the capillaries (Fig. 3). With this method, ionization can be made inside fine channels of honeycomb catalyst made of insulating materials. This discharge is designated as "honeycomb discharge". Electrical and optical characteristics of the honeycomb discharge were also measured. Fig. 2. Schematic of the "honeycomb discharge" reactor. Fig. 3. Images of honeycomb discharge for various ac and dc voltages in 3 cm capillaries [ISO 400, f/4, and 1/4 s].